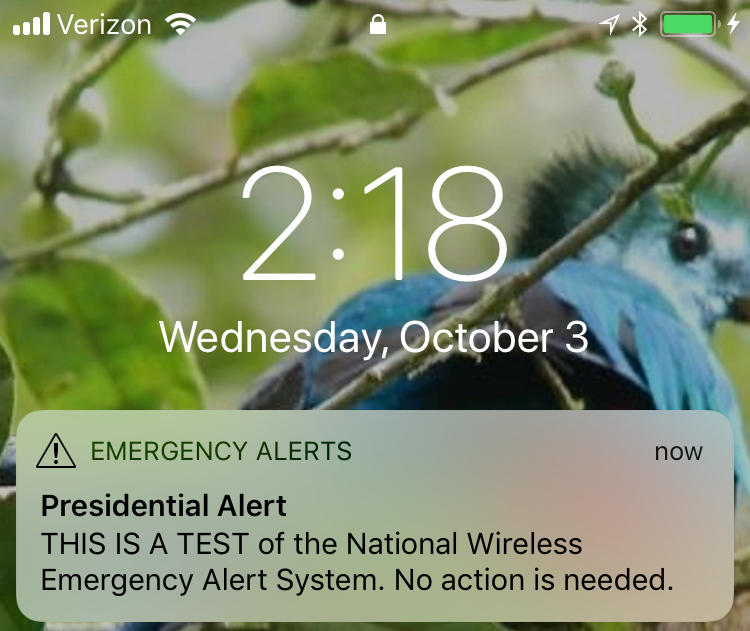 MANHATTAN (CN) – Three concerned citizens could not stop President Donald Trump from testing out an emergency text alert that popped up on hundreds of millions of cellphones Wednesday afternoon. The presidential alert expends the Federal Emergency Management Agency’s Integrated Public Warning System started by former President George W. Bush in 2006. Leading a lawsuit challenging the system under the First and Fourth Amendments, reporter J.B. Nicholas warned that the new system could become Trump’s second Twitter feed – and one that more than 200 million people across the United States will be forced to read. “The presidential alert system, which is compulsory and cannot be opted out of, violates these rights because it is tantamount to hijacking private property for the purpose of planting a government-controlled loudspeaker in the home and on the person of every American,” the 10-page complaint states. Another point the challengers made is that such a system is particularly dangerous in Trump’s hands. Finding their claims still “too speculative,” however, U.S. District Judge Katherine Polk Failla declined to block the system Wednesday morning. Hours later, FEMA fired off the system’s first “Presidential Alert” to little fanfare, in a bland message that fell far short of the lawsuit’s vision of a postmodern dystopia. Nicholas could not attend the emergency hearing Failla held this morning, and his co-plaintiffs, Kristine Rakowsky and Liane Nikitovich, represented themselves pro se. The pair acknowledged that they had been able to serve FEMA or the Trump administration. Though the government contends that the alert system is innocuous — only to be deployed in the event of natural disasters, acts of terrorism and threats to public safety — Nikitovich called these terms troublingly vague. “I know that seems far-fetched,” she added later. Before issuing her ruling, Failla peppered attorneys for the Trump administration and FEMA with questions about the system and how it would work. “The question is, who gets to make these decisions and how many people are involved?” Failla asked. The government acknowledged that, unlike Amber and weather alerts, there is no opt-out for the presidential system. Despite refusing to issue a restraining order, Failla said the challengers raise interesting constitutional issues as the case develops. She recommended that they retain legal counsel. Both Nikitovich and Rakowsky described themselves as small-business owners. Nicholas, a reporter, has a history of success in pursuing federal lawsuits. A former researcher for star civil rights attorney Ron Kuby, Nicholas won the right last year to sue the NYPD for revoking his press credentials. He is awaiting a ruling in that case. Nicholas was unable to flaunt his pro se experience in court on Wednesday because he had been hiking Vermont’s Long Trail at the time the federal judge set the schedule late last night. In a phone interview following the hearing, Nicholas predicted that he would be out of cellphone range for the first presidential alert. “I didn’t like the idea that it was compulsory,” he said of the alert system.